It’s simple really: This election is divisive because we Americans are actually really divided. There’s been a lot written about Donald Trump’s outrageous rhetoric, Hillary Clinton’s deep unpopularity, disarray in the Republican Party, and the role of a more scattered, frenetic media. All of that’s true. This is a unique political year, a perfect storm. A lot of ugly trend-lines converged in 2016 at the same time, testing our democracy, not to mention our patience. But it’s important to remember that democracy is actually a mirror of our passions. Across America, citizens are utterly at odds over which direction our country should take. In more rural conservative circles, voters want a more isolationist and protectionist nation, with less immigration and less free trade. More fraught and dangerous are the ideas gaining traction in conservative communities about race and religion. The right moved closer this year to openly rejecting the idea of an American melting pot, embracing instead the belief that white Christian culture is and must remain the nation’s center of gravity. Meanwhile, on the left, there are growing demands that long-established privileges and prerogatives held by whites — and in particular by white heterosexual men — be dismantled. Liberals have embraced the idea that anyone not actively harming someone else is an equal American and deserves a level playing field. They’re not on the fringe, they’re not alternative, they’re not transgressive. They’re just American. That means they should have full marriage rights and an equal paycheck for equal work. The left has also adapted to the idea that America will be an increasingly diverse nation, managing its engagement with a complicated world in part by bringing that world here, right into the heart of our thriving cities and suburbs. This group of citizens also, in ever-accelerating numbers, rejects the idea that Christianity should define our public discourse and policy. And here’s a big one, a real corker of a family feud: America’s left has broadly accepted the conviction that climate change is the defining challenge of our time. Meanwhile the right believes that opposition to big government (likely the only tool that can battle climate change on a global scale) should be the defining battle cry. How do you reconcile those different worldviews? So the noisy, raucous, and sometimes shocking divisions we’ve seen in 2016 reflect a growing chasm, not a ginned-up political circus. Yes, this chasm has been exacerbated by things like a broken news media and a broken Republican Party. If both of those important institutions were healthy, America’s deep divide might have been channeled into a more constructive conversation. On the other hand, there is something honest in what happened this year, something raw and blunt. Far more than John McCain and Mitt Romney, Donald Trump opened a window into our national rift that had been papered over. I think that’s healthy. The brutal conversations that happened on Facebook? Maybe they reveal more about our anger and divisions than the measured, even-handed reports we hear on NPR. Solutions to our national divide? I honestly don’t know. But here’s one thing that I think will help. This rift isn’t between red and blue states or between the Bible Belt and New England. This divide falls within each American state, a faultline between ever more diverse urban areas and more uniformly white rural towns. So we really have fifty different experiments underway in bridging the chasm, and that’s good. First, it seems inevitable that urban areas will win more and more political and economic power. In much of the U.S. this has already happened. In a democracy, power shifts to the places where the most people live. But this loss of influence is deeply unnerving and even enraging to rural whites. A healthy society should manage this transition carefully, with respect and sensitivity. If urban areas and their leaders steamroller rural areas in more and more parts of the country, imposing big city cultural values and regulations, while failing to help small towns transition to a more prosperous future, I fear the red rage marshaled by Donald Trump’s campaign will be a harbinger, not a culmination. Second, it’s important to remember that as fundamentally divided as we are, as angry and frustrated and flummoxed by our neighbors as we feel, the overwhelming majority of us are expressing ourselves peacefully. We’re fuming on Facebook, not firing pistols. We’re casting ballots, not bombs. And when we Americans go to the polls, we will, like it or not, make the journey together. first, what exactly is “big city cultural values and regulations” supposed to mean? and second, i am extremely skeptical that helping small towns transition to a more prosperous future is going to make any difference. we should consider that a) we already have a large transfer of wealth from urban areas to rural areas, and that b) in western europe, where there’s already much more redistribution and a much more robust safety net, one still sees very strong populist movements. i think brian’s red rage is happening on an axis orthogonal to economics. also, election predictions. i’ve got clinton 341, trump 197, improving over obama’s margin in 2012. she keeps all the obama states except iowa, pulling out squeakers in north carolina and (especially) ohio. On the same note, sort of, rural urban and suburban areas aren’t static, there is sifting going on. Many young people leave rural and suburban areas for more metropolitan places for college, or work and many other people leave more urban areas for retirement. Just as in the LGBTQ rights wars of the last couple of decades some of us who have been a bit oblivious to issues our family members faced, thinking “that sort of thing” only happens in other families will at some point realize that the “other” we hate is likely one of our own family. Or look to the SAFE Act, lots of people up here hate it but it ain’t going away because plenty of us up here are fine with it. But the real story is the demographic wave that is washing across the country. Looks like the Hispanic wave is taking out Florida in this election, maybe Arizona too. Texas can’t be too far behind. Is it possible for old white Republican men to hold enough power for redistricting in states like Florida, Texas, Arizona, Nevada, North Carolina or even Wisconsin in 2020? I don’t think so. City life is different from country life and that’s just the way it is. I have sympathy for and discomfort with various aspects of both. I love most aspects of small town life – it’s why I’ve chosen to remain when many of my high school friends moved to bigger cities – but the narrow-mindedness that often appears is the biggest thing that bothers me. Change is not always good. But it’s not automatically bad either. But change is going to happen whether you like it or not so be prepared to manage it as best you can, not resist it. Yes and no. The rural areas that are static are the ones that are badly struggling. The ones that aren’t static are the ones that have either turned themselves around or are on the way to doing so. Trump likes the United States of America. Hillary prefers the United States of the World. The problem is that many people in many parts of the world prefer that their countries remain their countries and don’t want them to become part of a one world government. This attitude is actually stronger in Russia, China and Muslim countries than it is in Western Democracies. Russia, China and Muslim countries aren’t in the least bit interested in singing Kumbaya. I heard this described recently as the difference between tolerance and equality. Many Americans have historically accepted tolerance. Even in the worst days of racism and segregation many whites could treat a black person with kindness and respect in their daily interactions (even though many could not). The civil rights movement became contentious because those same people didn’t just want to be tolerated, they wanted to be able to hold office, get paid the same amount of money for their work, and have the same educational opportunities as their white neighbors. The same thing has happened over the last 40 years in the LGBT community. At first they could be tolerated as long as others “didn’t have to see it” in public. Then they wanted to be in the open, have protection from retaliation, and access to same civil institutions granted to everyone else. Tolerance is a much easier goal than equality and I think this is where our culture is divided. As new groups build up power and clout in their communities, the power and privilege of those who have traditionally held it is diminished. We are a more pluralist society than we ever have been. No single group will be able to take control over the future of the country and all of the groups must begin to compromise in order for any progress to occur. Funny no rural areas in MA? Now one city I have lived in is Denver and I have no idea what that “urban” area is on the Colorado Wyoming border. That is quite a ways north of Ft. Collins (a pretty crowded urban like area now) in a very rural part of northern Colorado? What is that part of the Cheyenne Wyoming metro area? Also some of those desert areas of southern California? Urban? Joshua Tree National Park and the Mojave desert are urban? Brian, better check on the source for the map. 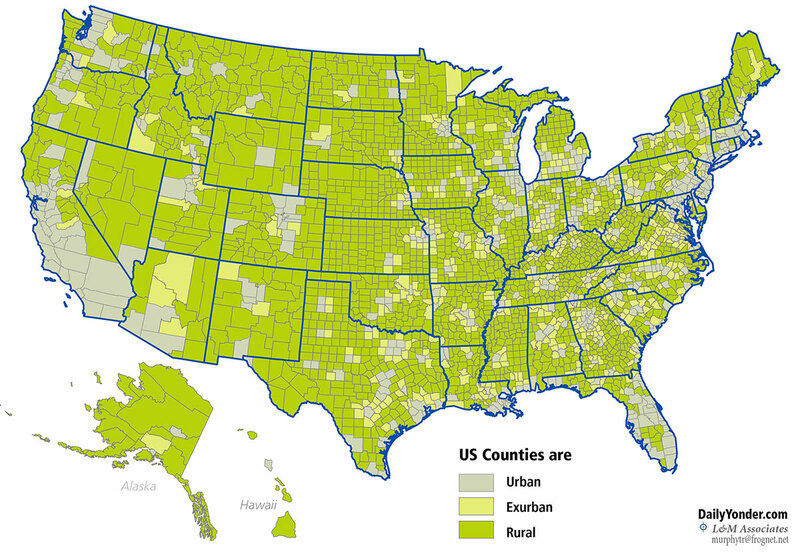 The whole urban rural thing is true this is just a weird map. A national disaster. God help us. Time to come together and make America great again. Most of the media has lost pretty much all its credibility. I am not sure how they plan to get it back? Who are you supposed to trust? whelp, wish i had that comment back. i guess it’s not the first time we’ve had someone dog whistle their way to the presidency. Fasten your seatbelts and watch the conman steal your wallet, your liberties and the truth. Trump/Pence will make Bush/Cheney’s crony capitalism, inept governance and lies look like an amateur effort. If you didn’t like slick Willie or the foreign-born Muslim let’s see how well you will like THUG Trump. Do you think Trump is for the common man? What a joke – he is for no one other than himself. America fell for the ultimate con. Trump said the election was rigged – but he won. And Trump said he wouldn’t necessarily accept the results. So like Trump, that gives us the option to not accept the results. Besides, Trump said it was rigged. Words matter. He can’t have both ways. Don’t forget, Republicans never accepted the legitimacy of Obama’s Presidency. To follow the GOP Senate leader Mitch McConnell’s line of thinking after Obama was elected we should now do all we can to make sure Trump only serves one term. In the 19th Century, voting turnout for Presidential elections was routinely 70-80%. In the 20th Century it dropped to 50-60%. Sad. And once again it looks like while Trump won the electoral vote, Clinton will win the popular vote – also a sad situation. The point is, Trump’s support (the people that voted for him) is less than 30% of the voting public. But the election is treated as winner take all and a mandate to impose your views and policies on the other 70%. Will Trump recognize that he won because of a few thousand votes in a couple of states. Will he be humble enough to accept that one-half of the voters disagreed with him and will he try to incorporate their views in his administration and policies? Yes, Obama and the Democrats share the blame for Trump’s election. The number of blue collar white areas that previously voted for Obama but went for Trump in 2016 is staggering. Obama came in with hope and change but surrounded himself with the same old establishment figures whose policies protected and enhanced big corporations and the elite while forgetting about how the little guy that got him elected was suffering out in the real world. Sanders focused on those issues and his popularity soared. But the Democratic Party was set on Hillary from the start and Bernie never had a fair chance. Republicans already controlled the US Senate, House of Representatives and a majority of Governorships and state legislatures. Now we have a Republican President. At what point do Republicans stop blaming others (Democrats, Liberals, Progressives, Muslims, Minorities, Immigrants, the Poor, Disabled, Women, LGBT, Elderly, etc.) for their failed policies. Scapegoating others is a common practice with authoritarian, fascist governments. Trump rallies looked like mob rule. Combine that with the Republican disdain for scientific knowledge and facts and we can expect Trump/Pence/Congress to blame the press, liberals, immigrants, etc. when the ocean rises and covers Trump’s Florida estate rather than their own refusal to address climate change. And when the economy collapses from trade wars and the continued decline of the middle class, Republicans will try to blame anyone they can other than owning it. They will deny the facts, skew government reports, and go after any of the press that doesn’t cooperate. Hmmm, sounds like Putin’s Russia. One more thing, isn’t it reassuring that a thin-skinned, petty tyrant will have the NSA, FBI, CIA and the US Military at his disposal to go after those that criticize or annoy him? Osama bin Laden won. America changed and responded for the worse, like he hoped. Putin got the buddy he hoped for. Will the average American that voted for Trump get what they hoped for? Doubtful. I hope I am wrong, but I can’t help but think – Hunger Games here we come. Everyone predicted that the US financial markets would collapse. What looked yesterday like a good reason to support Clinton. US markets are up. Did anybody get anything right about this? “Will the average American that voted for Trump get what they hoped for?” I hope not. I hope he doesn’t do half of the stuff that he said he wanted to do and voters who elected him are hoping for.